Image: Reza Aslan, author of "Zealot: The Life and Times of Jesus of Nazareth"
As I note in the program, I hope no one falls over when they hear I have recorded and posted a Word Magazine two weeks in a row. 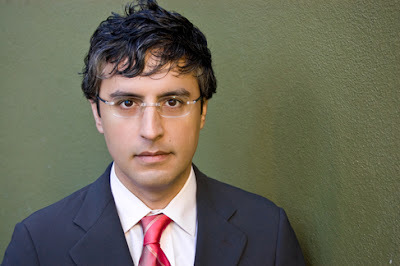 This edition is a review of another Reza Aslan NPR interview (this one on the "Fresh Air" program from 7/15/13). Last week's episode has nearly a hundred downloads (as of this afternoon), so there must be some interest in the topic. In this episode I focus on Aslan's challenges to the historicity of the Gospel birth narratives, including his charge that the historical Jesus was born in Nazareth rather than Bethlehem and that the Gospel birth narratives are "ridiculous" and "unhistorical to the extreme." Along the way I point out a few of Aslan's factual (like the obvious misstatement that "Bethlehem" is only mentioned in three verses in the NT) and philosophical/theological errors (e.g., false dichotomies between the "Jesus of history" and the "Christ of faith"). that the Gospel birth narratives are "ridiculous" and "unhistorical to the extreme." I may listen to your review, but based on the above statement, I have no interest at all in reading anything this man has written. Reminds me of my Anabaptist days when I read books that re-cast the King of Glory as some sort of communist/proto-marxist revolutionary. BTDT. No thanks! Yes, I see your point. Rest assured, I am not suggesting that folk read the book at all, and especially not for edification. Rather, I am interacting with the interview to offer an apologetic response and to suggest ways to respond when we hear these kind of arguments and ideas about Jesus and early Christianity from NT "experts"(on NPR, on the History Channel, etc.). I'll make a point to listen, then. That type of reasoning and POV once seduced me. I look forward to listening! It was excellent commentary. Thank you. I encourage you to continue interacting with these kinds of sources and contend for the faith! Glad you found it profitable. Thanks for the encouragement. I hope to follow up with R. Aslan's comments on the crucifixion next week.